Request your FREE - No Obligation Roof Estimate Today! Mast Roofing uses Conlin's Single-Ply Membrane Roofing Systems These are flexible sheets of compounded synthetic materials which are highly resistant to a broad range of chemicals, helping to extend the life of the roof, and offer outstanding reflectivity and energy-efficiency. Resisant to chemicals and pollutants. Extreme roofs need extreme protection. If your building endures extreme temperatures, frequent high winds, damaging hail storms, snow storms, and even fire hazards, you need extreme roof protection. 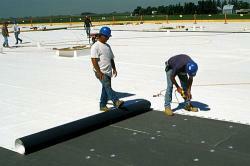 MAST Roofing can provide you with security and peace of mind through our Single Ply Membrane Roofing Systems. Made with Chlorosulfonated Polyethylene (CSPE), Hy-Crown has proven its durability and longevity over decades of exposure in the harshest environments. Conklin’s highly reflective roofing coatings also provide significant energy savings. By reflecting up to 85% of the sun’s energy away from the roof, cooling costs are drastically reduced. Temperatures of a roof surface are reduced by 80% or more when comparing a traditional black roof with a Conklin white coating system. The white surface reflects up to 85% of the sun's heat, creating a significant saving in reduced cooling costs. This "cool roof" energy saving has prompted state and federal governments to offer incentives for retro-fitting light colored roofing. We strive to be leaders in promoting energy conservation , and reflective roofing is markedly energy efficient. Check with your local utility provider or go to for additional details on tax rebates and credits. It is my pleasure to write this letter of reference for David Mast and his company, Mast Roofing. During a time of financial crisis in California Schools, we found ourselves needing roofing solutions for several older, portable buildings in the District. These buildings had been plagued with leaks for many years and we had no choice but to find a solution that would solve the problem. However, it was very important for us to contain costs at a time when financial solvency was a daily concern. Mast Roofing provided a very reasonable quote, completed the work in a timely manner, and they worked very well with my maintenance staff to accommodate our scheduling needs. The installation crew worked quickly and professionally and we have been very satisfied with the results. My maintenance manager also reported that Mast roofing went "above and beyond" when doing the critically important preparation for the roofing upgrade to ensure that we would have a long-term solution. I highly recommend the company and their product. Northern California including; Redding, Red Bluff, Chico, Paradise, Oroville, Sacramento, Yuba City, Marysville and surrounding communities! Montana including; Billings, Bozeman, Missoula, Great Falls, Helena, Kalispell, Columbia Falls, Whitefish, Libby and surrounding communities! Idaho including;	Pocatello, Sun Valley, Sandpoint, Boise, Coeur d'Alene, Idaho Falls, Lewiston, Moscow, Twin Falls, Nampa, Caldwell and surrounding communites! Eastern Washington including; Spokane, Moses Lake, Pullman, Richland, Kennewick, Pasco, Tri-Cities, Yakima, Walla Walla, Ellensburg, Wenatchee, Ritzville and surrounding communites!